Sometimes my fabric speaks to me - I'll see a piece, and suddenly a pattern will pop into my head. In this case, when I looked at this print all I could see was "pillowcase dress" - and I do NOT like pillowcase dresses. I've already made one doll outfit from it, so I couldn't do that again. Suddenly inspiration struck - a simple skirt for Natalie! She was asking me today about Minnie Mouse, and this fabric is "inspired" but not literal. Perfect. Except for one little thing. This fabric is nearly see-through. So here we are. A quick double-layer skirt (this tutorial will be for a size 4/5, roughly. I just measured my daughter's waist, and from her waist where I wanted it to fall (knee length) - so it's really just that easy to adjust. Just use your measurements, add half an inch for the hem (more if you're wanting a deeper hem and no trim) and 2 inches for the waistband. My rectangles started out 10" x WOF, and 13.75" x WOF. (width of fabric - in this case, 44") I also used a piece of 1.5" waistband elastic, measured directly to my daughter's waist. No bigger, no smaller. In this case, 22.5". Finally, I cut two pieces of pre-ruffled lace trim, WOF. Serge (don't trim) or zigzag finish one long edge on each skirt rectangle. Press it up 1/4" and attach your trim (or however deep you want your hems to be, if you're not adding trim). 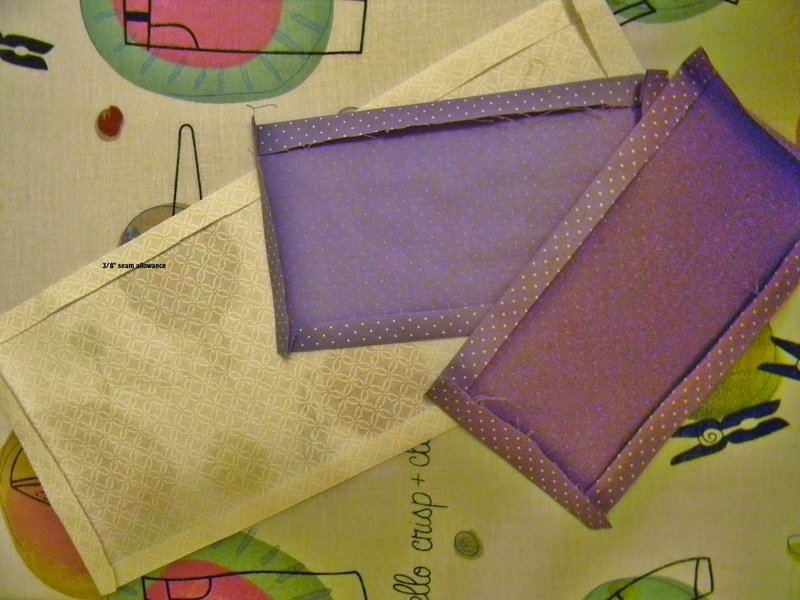 Attach your two skirt rectangles at the top (I just serged the raw edges together), one on top of the other. 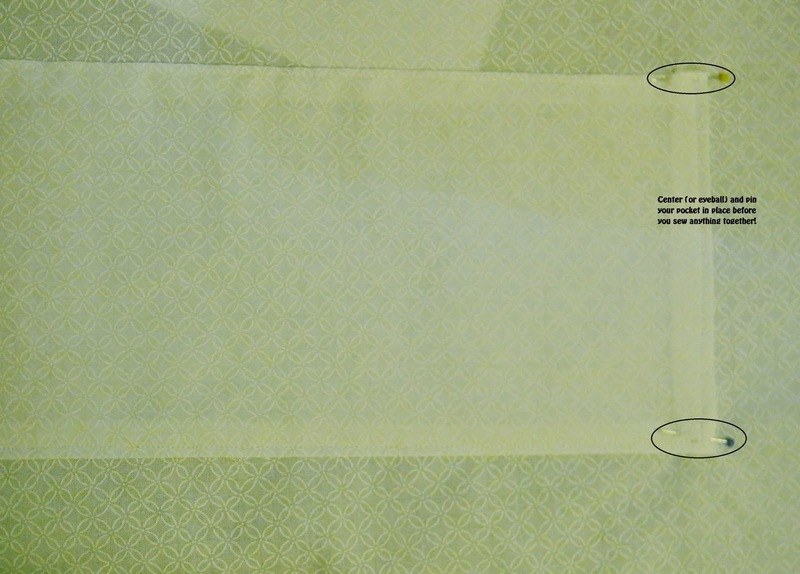 Then sew/serge your side seams - make sure to match your hems and trims. Sew your elastic into a loop, overlapping 1-1.5 inches. I sewed a box on the overlap with an X in the middle - it's sure to be secure that way, more than just a couple of backstitched lines. Divide your elastic into quarters and mark the points with pins - do the same with your skirt waist. Match the pins - fold the waist over the elastic 1/4", then pin together. Now sew around the waistband, streeetttccchhing the elastic in between to fit. Doing this by quarters ensures it'll make it all the way around evenly! 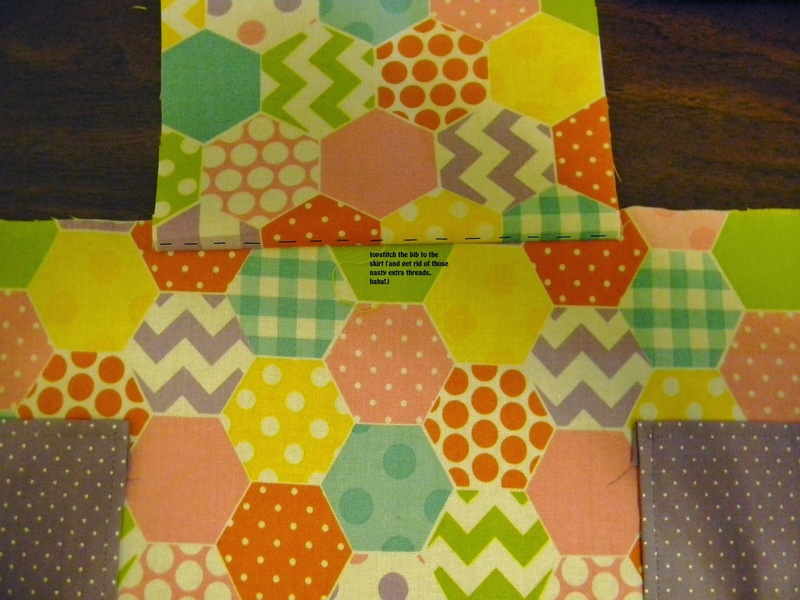 Finally, fold the whole waistband down, fully enclosing your waistband edges and the elastic. 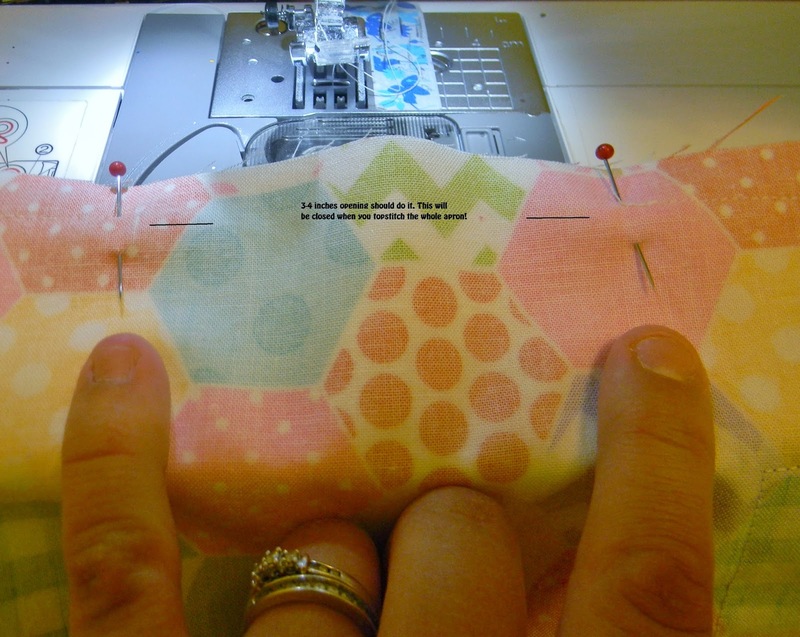 Sew about an inch/ inch-and-a-half down, just at the bottom edge of your elastic. You'll have to stretch again as you do this. Throw a tag in there while you're at it, if you have one! It's Time to Travel - through this great new e-book from Sewing with Boys! It's been so much fun reading through the e-book, exploring the printables and patterns and reading up on all the articles! Traveling with kids is always a particular kind of adventure, and Time to Travel is packed with activities and tips to make the ride a little smoother. I sewed up the Ready, Set, Go! Wallet and the Swansea Bag. The wallet is a gift for my nephew, and since he wasn't here my daughter is modeling it instead. Just shows you how versatile these patterns are, right? ;) Though the patterns come from a boy-centered collaboration (since, let's face it, boys get the short end of the stick in sewing much of the time! ), they're all excellent for girls as well! This little wallet is perfect for small hands and pockets. Velcro closure means nothing is getting dropped or lost, and the little vinyl pocket inside closes with Velcro too, making it perfect for coins or little "treasures". 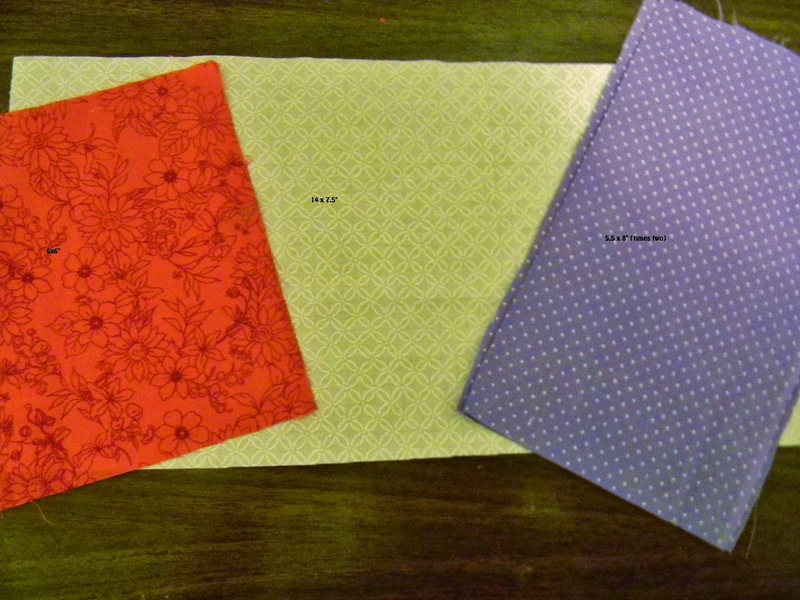 There's a big cash pocket and two small pockets, just enough space for whatever a little guy or girl carries with them! All edges are enclosed with bias tape, making it look polished - plus it provides an opportunity for adding a fun contrast color, if you wish! 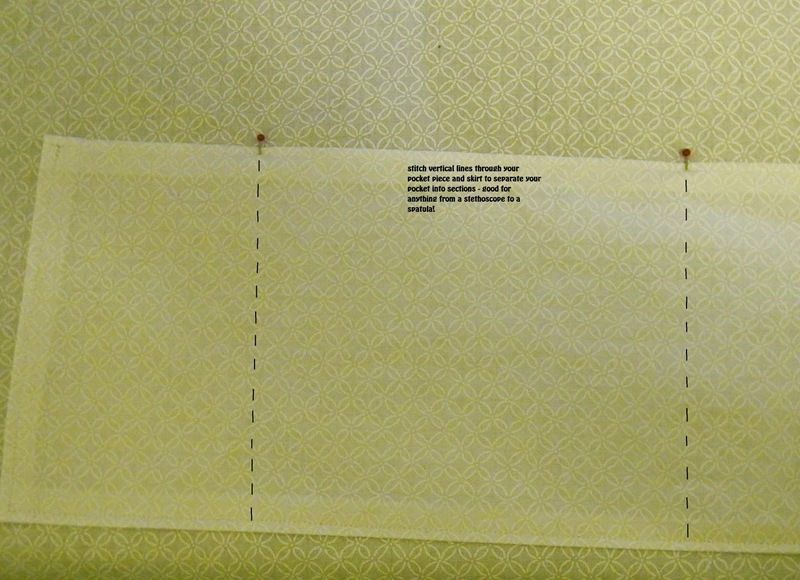 The instructions are easy to follow, and give great tips for the vinyl and bias tape, the only (slightly) tricky things about the whole pattern. I used denim from my stash for the outside, plus an adorable Riley Blake print for the inside, and store bought bias tape. The vinyl is a Walmart remnant I was lucky enough to come across. Making the Swansea bag was a step out of the box for me - it's so unlike anything I've ever made before, so I was intimidated! ...trust me, DON'T BE. It's basically 3 pattern pieces (5 if you add the optional pocket), and they go together so fast! I was able to sew the bag up in no more time than making a dress usually takes me, even with the added "challenges" of A) never having done this before and B) adding a lining. (The eyelets gave me fits, but that wasn't the pattern's fault - that was the eyelet package telling me to hammer "gently", and the eyelets didn't agree with that assessment. Haha!) I used a heavyweight corduroy, and flannel for the lining. Basic clothesline was the drawstring, and the eyelets and nylon webbing strap I found at Walmart! The drawings are easy to follow along with, even for someone like me who's all about photos. Plus, even without visuals, the written instructions don't leave any doubt about what you're supposed to be doing. I love the finished product - it looks so much like the seabags my husband carried around in the Marines, only way cuter! It's the perfect sleepover bag...blanket, pillow, and plenty of room in the pocket for a toothbrush! I also made up a couple of the "e-book extras" included. The lacing cards were so fun for my daughter, and she even got to help make them. She did the coloring, as you can see ;) and helped me glue them to cardstock to strengthen the printables. I punched the holes, and away she went! The adorable travel-themed pictures are perfect for taking on any trip, long or short. The pirate map is fun, too! There are a couple of options - you can make a freezer paper stencil, or cut the shapes out of felt. I made felt shapes, added details with fabric markers, and upped the fun by making them all movable - a little Velcro on the map and the backs of the pieces, and the kids can set up their map markers however they want! The map rolls up and buttons closed, so it looks and feels like a "real" pirate map - on to adventure! Now we'll talk about the e-book for a minute. It includes four patterns - the wallet, bag, and an adorable briefcase/coloring case, as well as an "Adventure Belt" - a neat cargo belt for carrying any number of treasures. Each of the page numbers in the index is clickable, bringing you straight to the page you'd like to be on - makes it so easy to find your pattern or article of choice! There's even a whole section in the e-book about choosing appropriate fabrics for your projects - I find things like that so helpful, because sometimes when I've never made a pattern before, I like to have some idea of what direction I should go! I don't like to be too adventurous the first time around a pattern, so having specific fabric types laid out for me helped a lot. Each pattern has cutting charts, layouts, and line drawings to help with every step. Plus, there's a sewing glossary at the end of the book, just in case you're unfamiliar with a term used! This e-book is my go-to guide now for anything trip/travel related - with all the tips, tricks, and fun loaded into it, it's the perfect companion to your next vacation. *If you buy the eBook and win the giveaway, we will either refund your money, or send the copy on to a friend of your choice. But that's not all! If you buy the eBook during the tour, you'll be automatically entered to win a $30 gift certificate to Fat Quarter Shop! Follow along with the rest of tour (and check out earlier stops you might have missed)! Hi! 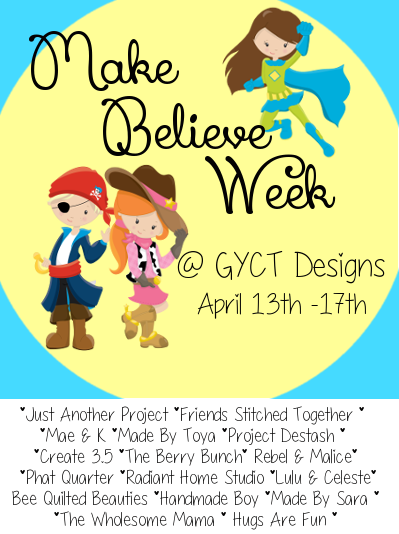 So happy to be part of GYCT's Make Believe Week! What better way to celebrate your child(ren) than to have an entire week full of fun ideas for free play? Even doctors need a checkup. Remember playing "house"? How about dreaming about what you want to be when you grow up? (I'm still wondering!) At different times in my childhood I wanted to be a nurse, a teacher, a mom (that one came true! ), a musician...I don't even remember what else. Two of the toy sets that my daughters have are a little doctor/nurse kit, and a play kitchen. I decided to make a one-piece costume - a reversible apron that will satisfy the imagination in the home or the hospital! I used Ellie Inspired's FREE Christmas Apron pattern as my base, modified to be reversible, and include a neck strap. You can find the measurements on the pattern - just join the Facebook group here and check out the files! Here's the rundown: Take your measurements, and cut your pieces - times two! You want one set from each of the two fabrics you're using (or more, I only used two to keep it simple, plus one more for accents). Here I have an white-on-white floral motif, a fun springy hexagon print, some dark lavender with white pin dots, and a little bit of red floral for an accent. I also used a lightweight woven interfacing on the white fabric - it's very thin and nearly see-through, but the little extra body doesn't hurt the apron, either! I cut a 6x6 square of the red floral, and ironed on a square of Heat'n'Bond Lite (just a bit smaller, say 5.5"). 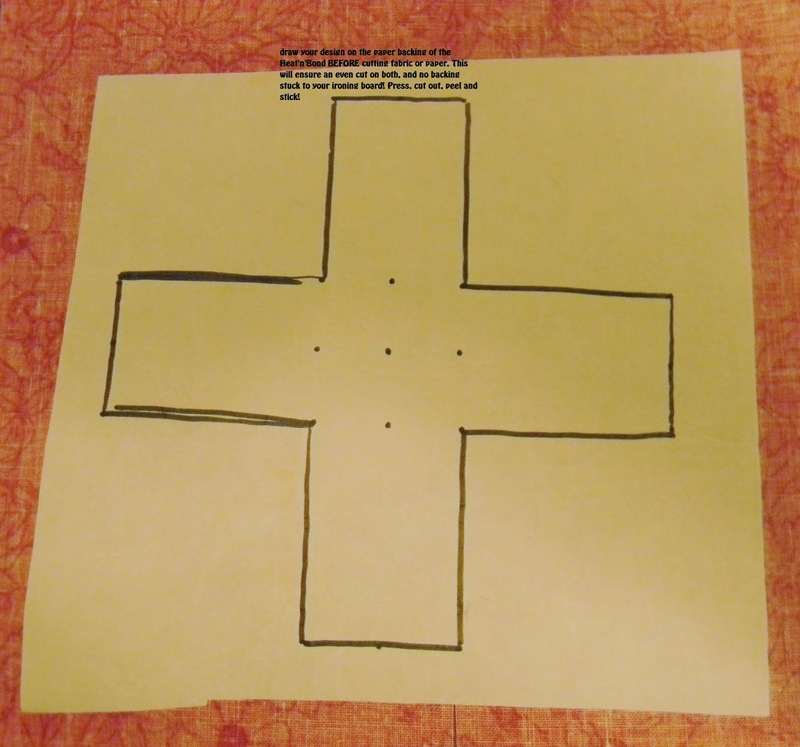 I made myself a grid and drew a four-inch cross with 1-inch wide arms on the paper backing, then pressed it to the fabric. Cutting through both layers together ensures neat edges. I also did a simple straight stitch around the perimeter to help keep it in place should I ever wash the apron. If you don't want to stitch, I suggest Heat'n'Bond Ultra. I cut a bib, skirt, and two waist ties according to the pattern measurements, then a neckband - it's the waist tie piece, cut on the fold. When you're finished cutting, you should have two bibs, two skirts, two neckbands, and four waist ties. My accents are the red cross symbol and my freehand pockets - 14"x 7.5" for the nurse side, 5.5"x 8" (times two) for the kitchen side (child small size). First things first - press down your seam allowances (I used 3/8") on the wrong side of your pocket pieces and topstitch the top edge (since it won't be sewn down, it needs to be stitched beforehand.) Attach your pockets to your skirt pieces. 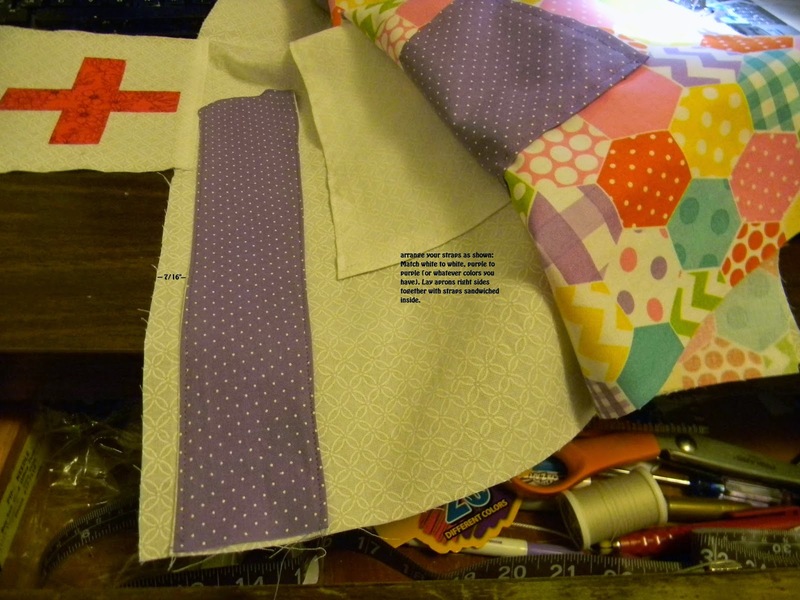 I also stitched vertical lines down my "nurse" pocket to make three separate pockets, 2 narrow and a wider one in the center. Prepare your waist ties and neck strap. Place one piece from each "character" of your apron (nurse to kitchen) right sides together. Stitch around all three ties, leaving one short end open for turning. Turn them right side out, press, and topstitch. I chose to round the ends of mine off - you can make points, or leave them square! Just make sure you trim your corners, or clip your curves, so the ends will lay nicely. Center your bib on your skirt piece, and stitch it on - I used a 3/8" seam allowance. Flip up the bib and topstitch. Press. Pin your straps in place. Your waist ties should be flush with the top of your skirt after turning - pin them even with each other, with just enough room at the top for a seam allowance. (Maybe leave an extra 1/16" so you know you won't catch your ties when you stitch!) The neck tie should be flush with the top of the bib - make sure the rest of it is inside the apron, and remember you're only stitching one side! Watch your seam allowance! Sandwich the whole of the neck tie inside the bib pieces. Also, note that your apron pieces and straps should be "matching sides together". This will ensure that your nurse apron doesn't end up with your cook's waist ties! Lay your other apron on top of the first one right sides together, and stitch all around the outside. Start at the bottom middle, and make sure you leave yourself a gap so you can turn the apron right sides out - about 3-4" should work. Trim your seam allowance and clip the corners. 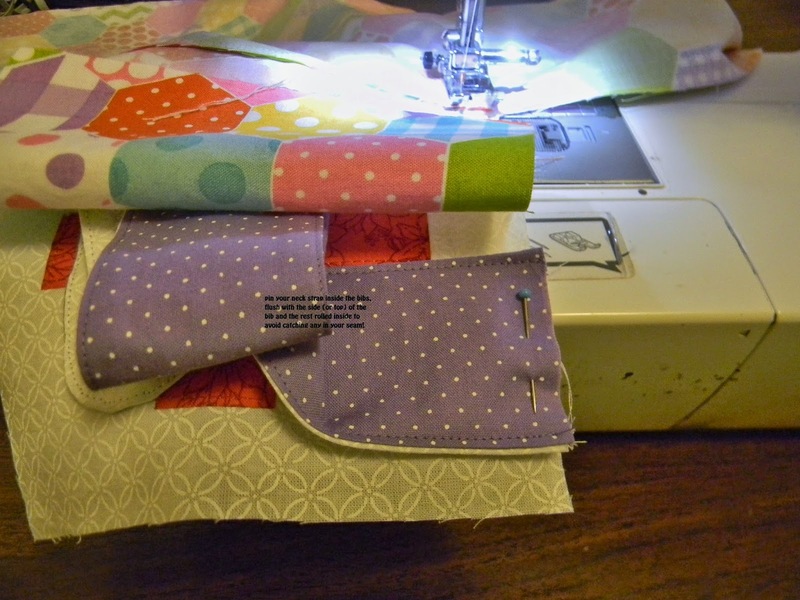 Clip into the seam allowance (but don't clip your stitches!) on the inside corners where the bib and skirt meet. You want to cut a little V in there, that will allow the corners to turn and lay neatly. 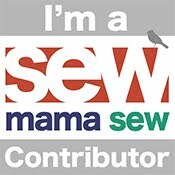 Turn your apron out, pushing the corners out, press, and topstitch! Voila! A cute little reversible apron - perfect for a doctor, a nurse, a chef, a butcher, a store owner, a construction worker - you're only limited by your imagination. That's what Make Believe is all about!